The reservation book for sea bass season is open. Taking reservations for opening day May 15th to May 31st. My Crew Have (usually have!) White Crabs For Sale AT THE DOCK for the low, low price of just $5.00 per generous dozen. There Is No Guarantee We'll Have Whites For Any Trip. Sometimes they all die. That shrinkage is why I prefer greens. We may be bringing some whites with us in the ocean. Green Crabs (not Whites!) Remain Provided As Boat Bait And Are Included In All Fares. Reservation staff hardly know what species we're after, let alone whether there will be a certain kind of bait. Really. It's a frequent occurrence. Sometimes even the very best toggers get their head handed to them despite folks all around having done well. Going Toggin Anyway! Tog Only, Sea Bass Are Closed Because NOAA Has Absolutely No Real Idea (but learning) How Best To Manage The Fishery. It's Simple To Prevent Motion Sickness, Difficult To Cure. Bonine seems best because it's non-drowsy. Truly cheap & effective insurance. In winter waterproof boots are almost a necessity. (and great socks! like over the calf smart wool .) While some rarely, or never, wear gloves for fishing, you'd not likely see me fishing this time of year w/o at least the half-finger wool gloves. Layers are best because, believe it or not, sometimes it can be very pleasant offshore--especially when the wind lays down. In winter it's warmer offshore owing to warmer waters. In summer it's cooler..
16,968 Reef Blocks deployed at numerous sites: TNC's Restoration Reef 278 - Doug Ake's Reef 3,193 - St. Ann's 1,585 - Al Giles/OC RUST Reef 1,185 - Eagle Scout Reef 919 - Sue's Block Drop 247 - Nichols' Concrete 852 - Capt. Bob's Block Drop 676 - Benelli Reef 341 - Capt. Bob's Reef 393 - Wolf & Daughters Reef 210 ..
Twenty Three Pallets of Block Were Recently Donated by DelMarVa Power - Thank You! Blocks are a small part of what we're doing. Prefer bargeloads of substrate but believe any forward motion is good..
Support the Ocean City Reef Foundation! http://www.ocreefs.org The OC Reef Foundation (OCRF) is a 501c3 non-profit with no payroll & no rented office space -- We Build Reef. Also registered w/Amazon Smile. We're Nowhere Near Reef Building's True Potential. Thank You! Seen on the web: "We already know all that. NOAA already does catch estimates. Why do them differently?" Mackerel fishing didn't work out last week. Water temps actually fell after that major blow. I suppose they're back south of us again? Going to keep trying once in a while. Capt. Ricky, a contemporary of mine up in DE at Fisherman's Wharf, was out mackerel fishing Saturday. They at least got to see what the fish look like. He & I both remember what it used to be; both fished for them as captain before their sudden collapse..
Also had two days, three really, where the weatherman & Mr. Murphy (of Murphy's Law) were in collusion. (new vocab word?) Seems 'light westerly wind' means "Come on out & get your butts kicked boys!" Overall, a handful of tog. Some keepers. Certainly no limits. Here Julie, Courtney, Ashton, & Tara work on some dinner and some science - tagging some smalls..
Sunday, with as gorgeous a forecast as might be had in March--light westerlies with sun & welcome warmth, I arrived at the boat before sun-up to find a fairly stiff NE breeze and a few nervous clients. Forecast gutter-balled, I gave a weather warning on the PA system & sent two clients packing. Underway & inlet cleared, the writing was on the wall; actually, it was on the fall. Because there was already a fresh NE swell developing, we were falling off taller seas.. Forecasts are pretty dang good anymore, but I suppose we still need a gentle reminder who's really in charge from time to time. Will have crossed the 17,000 mark on our reef blocks by my next report. Then one day 20K & 25, more.. Not sure how long this race will last, but one day my last. Those things are going to grow a lot of coral. Lots & lots of coral. The big projects though, bigger than what we've done yet - like the one we're going to do in 2017 with CCA & The Nature Conservancy, that's where the real reef will be.. I have never had any serious buy-in from NOAA that fisheries production might have been altered, lessened, lowered to near-absence in habitat's destruction during the first several decades of industrial fishing, but there are NOAA folks who get it. It's just not-quite where NOAA-proper wants to go yet. Even yesterday there was an article on NOAA-funded dam removal. We're all familiar with NOAA's estuary works in sub-aquatic vegetation & oysters; Top managers just need them to put-away their waders & come offshore a-ways. Soon as they do that though, it's off to the deep where true discovery awaits each & every lowering of their multi-million dollar submersibles. They skip over the habitat we most need repaired & go to the cool stuff. Fixing near-shore fisheries' decades old habitat problems is never going to be as cutting-edge as discovery in the deep. MRFSS = Marine Recreational Fishing Statistics Survey - the recreational catch estimates begun in 1981. Fishers say MuRFSS, most managers say MurFiss..
VTR = Vessel Trip Report - a NOAA federal form in quadruplicate, loaded with catch info, that MUST be submitted to NOAA for each & every fishing trip by commercial & many For-Hire skippers. Any error or failure to fill in required boxes results in a return to the permittee for correction. For-Hire = Party/Charter = all partyboats and charter boats combined. I believe a primary distractant, a reason managers aren't pushing reef restoration or spawning biology as fisheries tools, is recreational catch data. Our catch jumps around so much it's hard to imagine a fairly steady stream of habitat-based fisheries production coming region by region. NOAA forces all & everyone to use their recreational catch estimates of what we caught -- use them whether anyone believes them or not. A new record catch one year, a new low the next. The very next year catch is sky-high again.. The manager wonders, & I've had them pose this very question: What's habitat got to do with it? I've tried many times over the years to illustrate how incorrect recreational catch estimates upset rational thought in fisheries science & especially management -- to show the lay reader how bad data is not only robbing us of recreational quota, but that these fictions are so extreme; in some cases incorrect catch data can rob us of whole seasons - think cobia, winter sea bass, Gulf of Maine cod all year, NY's incredible history with fluke regulation.. I want to try again to show interested readers this falsehood, this "we know what you caught" attitude of NOAA's. I want to try to keep this piece from getting sticky. Like writing an interesting article on tax code, it's a challenge. I've used from among several of my older works with significant effort, and have much fresh perspective here as well. Right now, & for some very long while past, it has been NOAA's policy that recreational catch estimates be used "as is." No modification allowed. Even if an estimate stinks to high-heaven, use it. Fishery Council/Commission debate during the early years of management bogged-down when champions of truth fought for sanity. It was never ending. Deliberations went badly. Instead of fixing the data, NOAA repaired this regulatory sluggishness thusly: No Debate On Recreational Catch Allowed. Congress did order a repair of MuRFFS (Marine Recreational Fishing Statistics survey) in 2007. That repair came out in 2012 & was instantly revealed, in my point of view, as a worsening of the very problems that had plagued MuRFSS. Here is an example of an older 'spike' in recreational catch statistics. According to this data fishery managers had to use, small recreational boats in Massachusetts - "Private Boats" - caught and killed 1.5 million cod in 2010. That's because, despite 10s of thousands of tag returns, all recreational cod discards - throwbacks - were also counted as dead in 2010. Using MRIP's "Avg Weight Pounds" from March/April 2010 of 9.6 pounds apiece in the same data-set, we see Massachusetts' small private boats "must" have caught 14,176,000 pounds of cod, by official estimate, in April of 2010 -- March was closed. They had to catch them in just April. Massachusetts's commercial fishers, (known world-wide for their gentle handling of a resource?) landed 1,060,000 pounds in the same period. Small boats in MA had never-ever caught like that before. Ever. Yet they had just outfished the commercial sector by 13 million pounds in one month.. On paper. It was Private Boat owners' who were responsible for the sudden demise of Gulf of Maine cod that year. Yes Sir: Recreational Over Fishing. You could read about it in the papers. NOAA had the evidence to back it up ---- They Had Statistics. It should also be noted that while these Private Boats were decimating the newly-rebuilt cod stock during New England's notoriously foul April marine weather; that while Grady Whites & Boston Whalers were fishing incredibly hard in an ocean where men in large fishing boats die; that while outboards were catching 14.2 Million pounds of cod in April; the For-Hire Partyboat/Charter boat cod catch for the same period was 52,000 pounds -- not even a hundred-thousand pounds..
Now: What I really want to introduce is the idea that fishing is more of a constant than NOAA fisheries' data indicates. Way more smooth. Yes, populations shift. Yes, catch improves & declines. Still, every spring this or that church group would fill 2 buses to charter Capt Wally's big partyboat. The early birds at the Marina would have their boat in a slip, even though the fresh water might not be on yet, (but mostly the marinas are empty.) (I'm currently the only boat in the water at the Fishing Center 500 miles south of where this cod massacre supposedly took place..) Fellows with a little more scratch book a charter with a guy who's been doing it 40 years. There are not many options in April. Most early spring cod fishers, including many private boat owners, enjoy a party boat. It might be spring on land, but trust this, on water it'll be a lot chillier. Having heat is a wonderful thing. I was told by an exceedingly long-experienced Massachusetts partyboat skipper that in April there's no way Private Boat catch exceeds 10% of For-Hire. In fact, he seriously doubted it could even be 5%.. If he's right, and if the MRIP For-Hire catch estimate is right, then Private Boats actually caught 5,200 pounds & not 14.2 million. Of the few Private Boat estimates in that table above, it's very likely only the 2004 estimate is even in the ballpark. This is an older MuRFSS set, and MRIP did lower that very estimate by a lot. Down to 160,000 fish from 1.5 million - and it's still absolute rubbish. What I'm hoping to convince NOAA & Management of, the scientific community as well, is that for every recreational fishery there is a constant, a ratio of For-Hire to Private Boat catch. Here's a look at a MuRFSS's failing on the high side -- one that I can prove. Here Maryland is shown landing 237,307 sea bass in Sept/Oct 2000. With a fast 90 foot party boat carrying at about 2/3rds capacity, I landed exactly 29,626 bsb in Sept/Oct, 2000. MRFSS has Maryland For-Hire Sept/Oct landings at 237,307.. I'm positive this estimate is absolutely at least 180,000 sea bass too high. My district's Congressman was Wayne Gilchrest back then. He chaired House Fisheries. He heard about this business & listened. We were losing season, watching our size limit go up, and threats to create a creel limit grew more real as MuRFSS' assertions of overfishing weighed on managers. They had no idea the data really was no good. Didn't believe it. Biggest joke ever, "Did you hear about the rec fisherman complaining about data?" Har-har-har.. Had to show them. This was one of many tables used for just that. All our estimating programs seem to over-respond. When catch is good & increasing - data skyrockets. When so-so or in a slight decline - data searches for new lows. We've had two big shifts in data caused by recreational fishers complaining to & lobbying Congress. A sliver of one is shown above when in 2003 when Party/Charter skippers were screaming about bad estimates on our side of the fence. MuRFSS was making claims we knew weren't correct because we were keeping track of our own catches. Time after time we were being assigned tighter regs based on overfishing assertions supported only by catch estimates we were sure could not be true. From that point forward - in 2004 the Private Boat part of MuRFSS began to grow greater & greater, and Party/Charter (or For-Hire) began to lose catch, mostly in factual response to regulatory tightening - but sometimes in statistical lunacy. Lots of time & LOTS of money to repair MuRFSS, only it didn't get fixed. Our recreational catch data got worse. Years ago many in management began to openly question the data NOAA was providing them on recreational catch. I believe we're at a different juncture, a time when change may come to how estimates are used because of push-back from within the management community. Speaking of Statistical Lunacy, here's Maryland's 2016 Sea Bass MRIP estimate for all modes. PRELIMINARY 2016 BLACK SEA BASS PARTY BOAT 0 . 0 . Party boats that advertise, target, live or die by sea bass -- what I do for a living -- We Caught Zero Sea Bass. Shore, where tiny sea bass are a pest to flounder & tog fishers, now that was the place to be in 2016! Their sea bass AVERAGED 1.5 pounds!!! From Shore!!! And, man, did they load up on em.. In fact, Shore anglers had, by far, the largest average size of sea bass in 2016. Except no they didn't. This table is stupid beyond belief. In my industry we have to tell NOAA what we caught everyday or NOT have our permits renewed. NOAA, I guess, doesn't have to use the info we gave them. In fact, the guys I've met in charge of some aspects of NOAA Fisheries Science apply examples of bad-apple reporting to all our reports. Because some skippers have sent obviously bad inputs -- all their lobster coming from Boston Harbor when they're really working George's Banks: NOAA Does Do Not Want To Use Our Data. Here's a direct comparison of the old MuRFSS program & NOAA's new MRIP recreational catch estimating method. This is a steady fishery. Party/Charter catch the heck out of scup up there. Our "new & improved" program spent millions & millions to determine MA party/charter caught between 20,000 & 1,450,000 scup in 2004. Then, in 2005, between zero & 3,200. If this continues as our "best scientific information available," we'll never escape bad data's grasp. Coming now to today's issue, and could easily go to book length with bad data examples, we see sea bass & summer flounder (fluke) catch estimates continuing to go against rational/factual observation of those fisheries. 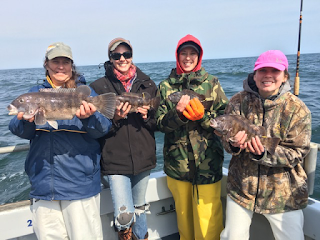 NOAA claims summer flounder (just 'flounder' here, but 'fluke' north of Cape May) ..NOAA claims fluke will require a 30% cut in harvest because of lower populations of late. NOAA is simply seeing fewer flounder in their stock assessments (stock = population) and require a 30% cut in harvest for both recreational & commercial fishers alike. Yet despite lower populations & stable regulation, several states have Private Boat catches that have skyrocketed - doubled. Personally, I do think summer-flounder/fluke/flounder (all same fish) have declined a bit. Regardless, owing to MRIP catch estimates, some states are getting HAMMERED with this 30% stock assessment based cut, concurrent with another assertion of Private Boat overfishing as well. There will be more about fluke, but first allow a look at sea bass. Sea bass were just estimated---in their highest rated, most accurate benchmark stock assessment the species has ever had---at around 250% Rebuilt..
That's right. There's a jag of em. Not so much down here as regular readers will recall, but up north where the population has exploded on newly "just warm enough" rocky bottoms along Southern New England, & owing draconian regulation. However, owing to MRIP's assertions of wildly high catches, we have absorbed almost that entire increase --- population 2.5X higher than NOAA's anticipated measure of 'success' --- but because of 'Overfishing' (over-harvest more properly in the managers' world) we will see no decrease in regulation. In fact, owing only to MRIP, and this is crazy, some states may have to take a cut in sea bass despite the largest population on record & already ludicrously tight regulations. It is illogical beyond belief to have Private Boats as an overwhelmingly powerful force in the temperate reef fisheries. NY's Private Boats, for instance, in all the years leading to today, are thought to have caught 762,000 pounds of sea bass during Nov/Dec (wave 6) from 1981 to 2015.. All those decades combined--all added up--equal 3/4 of a million pounds. Yet in 2016 MRIP has NY Private Boats catching 719,000 pounds in Nov/Dec.. Dern near 35 years worth in one year. Consider too: all Party/Charter in the Mid & North Atlantic from 2006 to 2016 landed 700,000 pounds.. So, according to MRIP, all states in the management zone & all their Party/Charter boats over a span of 10 years during Nov/Dec didn't catch what NY's Boston Whalers & Grady Whites caught in 2016. Recreational Private Boat fishers in New York, in 2016, are said to have caught 1,846,000 pounds of sea bass all year. Not the whole coast's Private Boats - just New York. Management truly fears this powerful force & must factually react to it in regulation. To put that 1,846,122 pounds of Private Boat sea bass catch by one state's Private Boats in perspective: the 10 year average for all Commercial Trawl & Trap from Cape Hatteras to the Canadian border is 1,612,000 pounds a year.. (They do not publish commercial data w/o a year's delay, but 1.6 million is going to be pretty close.) Therefore NY's private boats outcaught commercial fishers from North Carolina to Maine by 234,000 pounds. It could also be said that these die hard anglers also outfished All Party/Charter from Hatteras north all year..
A manager would have to conclude - and I do mean "Have To" - that NY's Private Boats outfished every Party & Charter Boat north of Hatteras by 625,000 pounds in 2016. That information is, after all, straight out of NOAA.guv's "Best Available Scientific Information." They would also Have To conclude these small boats outfished the trawl fleets & trap boats from Hatteras north. It's these big spikes in the data that cause our regulatory pain. All 2016 For-Hire, PLUS the average annual Commercial catch = 2,833,111 Pounds. My point here, (and for decades,) has been we must find a way to test catch estimates before they are used to represent catch. We have to STOP using bad data that no one believes, whole & uncorrected in any way, as though working an engineering problem with fabulously precise and long-since truthed data. NY BSB - This is all MRIP data, but I have highly modified its presentation. Watch how the Private Boat column slides into high six digits while For-Hire never escapes five. In the furthest column right I've added "Percentage of the Catch" then an approximation using what life-long fishers have represented to me as an 'average' percentage of catch. Here there are 9 years out of 16 where Party/Charter is shown to catch just 20% what Private Boats land. In 2013 & 2014 that dips below even 5%.. I am not trying to represent this table as an accurate product. To do that NOAA fisheries would have to truth the For-Hire catch with VTR data & any other means they might have. Here I'm trying to demonstrate how we might achieve better Private Boat accuracy by using average known percentages of catch between For-Hire & Private Boat. This is simply a means to quickly flag bad data for closer inspection. If we generously give NY's Private Boats a 60/40 split, with Private boat on the high side, a manager or data analyst could swiftly identify problem areas for further refinement.. If you'll recall the Massachusetts cod skipper claiming "I doubt Private Boats catch 5% of our state's cod in Mar/Apr" -- For NY it seems, from reports I've received, with its widely separate regions & fishing grounds, that Private Boats catch a bit more more than 50% of that state's sea bass in summer & a bit less in the fall. One thing's for sure, outspoken recreational fishers in NY have complained bitterly about partyboat sea bass catch. From among those very same anglers are MRIP's biggest cheerleaders. If MRIP is right, then they're wrong to complain about partyboats. They'd need to have a Pogo Moment as I did with tautog in 1984, "We have met the enemy and he is us." At MRIP's low levels, professional effort wouldn't be an issue - except the data is wrong. Where the true Percentage of Catch is for summer flounder (below) would take a lot of work to develop. Each region, and each sub-region within, would have different percentages. I promise -- NOAA has folks who could figure it out. They'd just have to be told to get it done. The above is a broad coastwide data set. This idea for checking estimates before they become regulation is intended to be used at the two-month 'wave' level. Here's a much lower-level look.. In Maryland I'd estimate For-Hire catch at better than 20% nowadays. Used to be lower. We're gaining on em..
How's that for "All Over The Place!" ..but those are the estimates we live & die by ..the estimates management turns to in devising regulation -- and always will. Could sure use some truthing. There's no possible way to get your arms around our issues with bad catch data in a single (if brutally long) email. Bad data's effect has been persistent--chronic. It has robbed us not only of season; but of time for management & science to truly consider all their tools of restoration. From Crevecoeur's 1782 work, "Letters from an American Farmer" http://xroads.virginia.edu/~hyper/crev/letter09.html see 243 & 244 for exact section. Here he finds a slave in the woods accused of murder; chained inside a cage to die a slow death. Not at all for the squeamish, skip it if you're eating. I include this brutal passage from Crevecoeur to tone how I see NOAA's forced use of bad recreational catch data---This is how I see bad data's affect on the recreational fisheries. We are chained to MRIP, each and every two-month estimate is as Crevecoeur's birds.. "I shudder when I recollect that the birds had already picked out his eyes, his cheek bones were bare; his arms had been attacked in several places, and his body seemed covered with a multitude of wounds. From the edges of the hollow sockets and from the lacerations with which he was disfigured, the blood slowly dropped, and tinged the ground beneath. No sooner were the birds flown, than swarms of insects covered the whole body of this unfortunate wretch, eager to feed on his mangled flesh and to drink his blood." In no philosophy of testable science is there inclusion of data no one believes. Fisheries is the only science that allows--encourages--such data. No One Believes NJ Jetty Fisherman Caught More Tog In March & April 2010 Than The Whole Coast's Commercial & For-Hire Fleets. No one believes MA Private Boats caught 13 million more pounds of cod than their trawlers. No one believes Private Boats could out-catch every Trawler/Trapper/Partyboat/& Charter. MuRFSS/MRIP are not our "Best Available Scientific Information." Often they are simply 'disinformation' as in the finest of Soviet tradition. We must find a way to correct the data. The new Electronic Vessel Trip Report (eVTR) being tested this summer may indeed solidify For-Hire data. But that's not where the big problem is - the worst of MRIP's data is in Private Boat.